10. And the twenty pillars thereof and their twenty sockets shall be of brass; the hooks of the pillars and their fillets shall be of silver. 11. And likewise for the north side in length there shall be hangings of an hundred cubits long, and his twenty pillars and their twenty sockets of brass; the hooks of the pillars and their fillets of silver. 12. And for the breadth of the court on the west side shall be hangings of fifty cubits: their pillars ten, and their sockets ten. 13. And the breadth of the court on the east side eastward shall be fifty cubits. 14. The hangings of one side of the gate shall be fifteen cubits: their pillars three, and their sockets three. 15. And on the other side shall be hangings fifteen cubits: their pillars three, and their sockets three. 16. And for the gate of the court shall be an hanging of twenty cubits, of blue, and purple, and scarlet, and fine twined linen, wrought with needlework: and their pillars shall be four, and their sockets four. In the courtyard was the brazen altar of sacrifice (altar of burnt offering), and the brazen laver. 6. 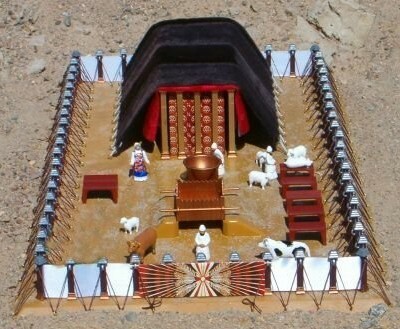 And thou shalt set the altar of the burnt offering before the door of the tabernacle of the tent of the congregation. 7. And thou shalt set the laver between the tent of the congregation and the altar, and shalt put water therein. 8. And thou shalt set up the court round about, and hang up the hanging at the court gate. The services of the altar of sacrifice are symbolic of and point to Christ's sacrifice on the cross and the washing at the brazen laver of baptism. Daily sacrificial services for sins and offerings were carried out in the tabernacle courtyard. Click here to go to the exodus tabernacle.